It's time for some more fast-paced action! 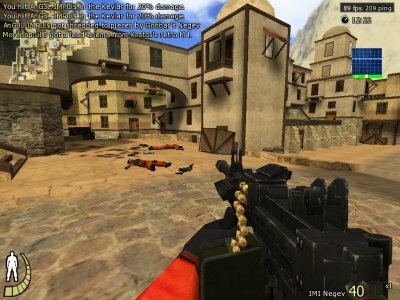 In the last article, we have reviewed three excellent First Person Shooters (FPS) - OpenArena, Sauerbraten and Nexuiz - which offer you a good mix of solid graphics, fast-paced action and cross-platform compatibility, while being simple to use and configure, free, stable, and low on hardware demands. 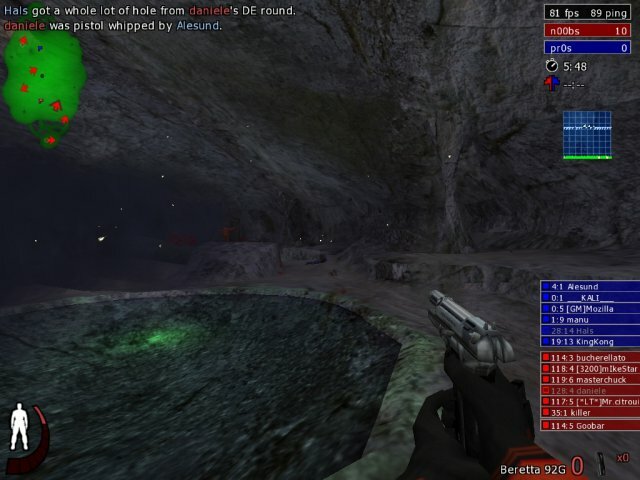 OpenArena and Sauerbraten allow you to test your fingertip skills against a range of monsters in both the single and multiplayer mode, whereas Nexuiz is geared toward online, multiplayer gaming only. Regardless which one you choose, you are in for some great fun, killing nefarious fiends from another dimension. Today, we'll talk about games where you play as a human - against other humans. Our two candidates are AssaultCube and Urban Terror. 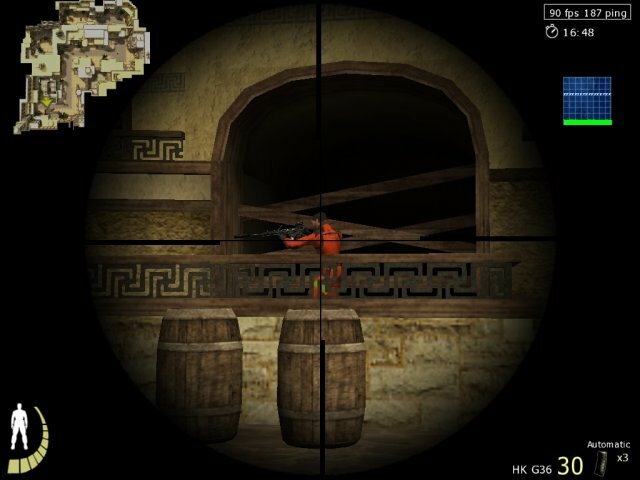 AssaultCube is one of the smallest, yet good-looking FPS games available. 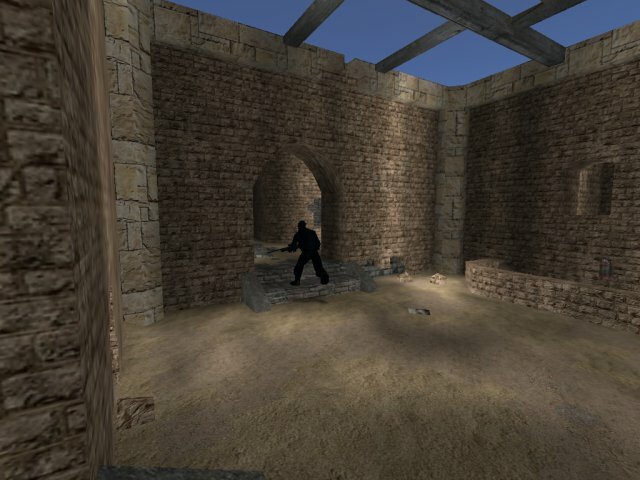 It packs neatly into 19MB of funs and realism, based on the Cube engine. While it may appear somewhat spartan and archaic compared to multi-GB behemoths out there, it is a reasonable choice for people with weak machines or slow Internet. The graphics is reasonable if not stunning. The action is moderately fast-paced. If you're not the finest gamer, you may consider AssaultCube for testing and honing your skills. Compared to other games reviewed in the last article, as well as Urban Terror (see below), it's slow and relaxed. This does not mean you can make yourself a cup of coffee in between the shots. It's faster than CounterStrike, but not as hectic as OpenArena, for instance. 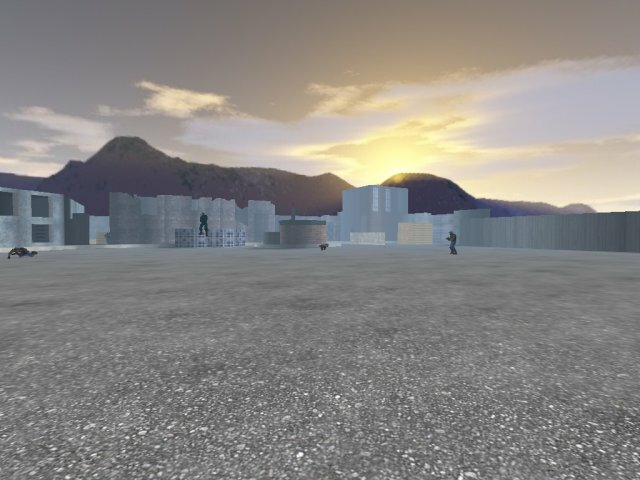 Despite being small, the game features quite a few combat modes and a rich if invented assortment of rifles, sub-machine guns and pistols. Some weapons have a mighty recoil, which can be exploited to perform moves that are otherwise impossible. Skilled players will use their weapons to perform some neat acrobatics. Some people tend to disregard AssaultCube as a second-rate product - entirely missing the point. It's a simple, solid game for slow machines (P3 with GeForce 2 cards will do nicely, thank you), taking only a handful of megabytes to unpack. This makes it well-suited for laptops that cannot handle heavy games or portable devices. Being light, it will also bear with slow Internet connections, including 56K dialup. All in all, it's a fun, useful product - especially during tedious meetings. This is a truly magnificent game! Invest 3 minutes of your time and read on. You won't be disappointed. 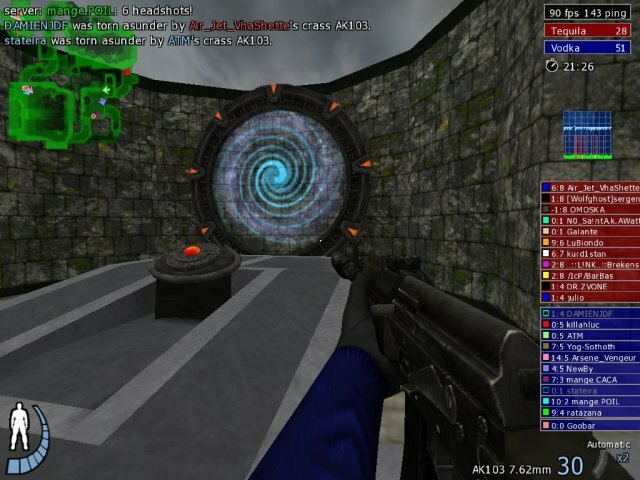 Like the other three games (OpenArena, Sauerbraten and Nexuiz), it is also based on the Quake 3 engine, with some major modifications. First, Urban Terror aims at being realistic. To this end, it occurs in the real world, with humans of both male and female persuasion killing each other ever so happily with real-world weapons on maps named after authentic places (cities, regions, countries) like Austria, Casa, Riyadh, and others. Second, Urban Terror introduces fresh, new elements of physics into the game, branching away from the standard Quake stuff you may be used to. In Urban Terrors, players can power-slide, jump off walls, grab ledges, and climb over obstacles like fences. These somewhat un-human elements are smartly contrasted by stamina fatigue and injuries you may suffer, whether from over-enthusiastic jumping or enemy fire. Wearing a Kevlar vest will limit your acrobatics and make you tire much more quickly, but it may save your bacon here and then. On the other hand, if you're hit by bullets, you may call for help from your fellow teammates, who will then administer basic medicking to your wounds. They should make haste, too, because bleeding can be fatal in Urban Terror. Third, maps are beautiful, neither too small nor too big. They are well made, both aesthetically and strategically, without giving any one party a major advantage when fighting. The maps are maze-like circles, allowing a player to go around without retracing his/her steps. Thus, there are no dead ends or "surprise" corners where a camping-happy player could hide forever, turkey-shooting the enemies. You should expect your foes from any angle at all times, but this only makes the fights the more exciting and interesting. All combined, the game elements are well blended into a realism mix that is neither too real not too arcade. You will know you're not fighting for real - still, you will care and make sure you make your best effort. The weapons are very good, too. There's a broad range of weapons to choose, as well as other combat accessories. You'll be able to tote a primary weapon, usually an assault rifle of some sort, a secondary weapon, in the form of a sub-machine gun or a shotgun, a pistol, a knife, and some grenades. You can also trade your Kevlar and helmet for extra grenades, a silencer and a laser pointer. Oh, by the way, Goobar in the above two screenshots is my holy royalness! I'm on a rampage (11 kills), oh yea! Ah, yes, where were we ... ? Different weapons look differently, sound differently - and inflict different damage, making the choice of a weapon a true tactical ingredient. For example, the AK-103 is great for close-combat encounters due to its tremendous firepower, while the scope-fitted H&K G36 is good for intermediate range encounters. The game is quite popular. At any given time, there are about 600 servers up, with approx. 30-40% teeming with people. There is a broad range of maps, some of which you will not have initially, but which can be downloaded through the game, without any extra fuss. Game match modes are numerous, too, with the most popular being Team Deathmatch and Capture The Flag. In general, most fighting is based on some sort of team rivalry. 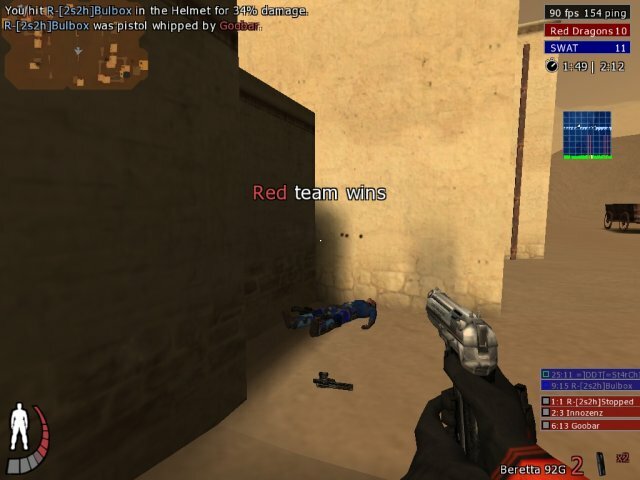 You have the Red Team and the Blue Team and the two contest to death. Women are not being discriminated in Urban Terror, for the players can choose female looking skins for their characters. The fairness between sexes is further reflected in audio effects essayed by players when hit by bullets. Women tend to sigh more when collapsing under a hail of lead, while men use a more generic gggrrrh. Urban Terror runs great on the LAN, as well. It's a fairly big download, approx. 750MB, but the installation is extremely simple. In Linux and MAC, it's a simple extract to a directory. In Windows, the extractions is wrapped in a would-be installation, although you can move the game folder about and play the game in the portable mode from a USB drive. Urban Terror is also quite light on resources. On my Nvidia 6600GT card (3 years old), the game renders 80-90 Frames Per Second (FPS) in all situations, making it quite appealing for people with low-spec machines. 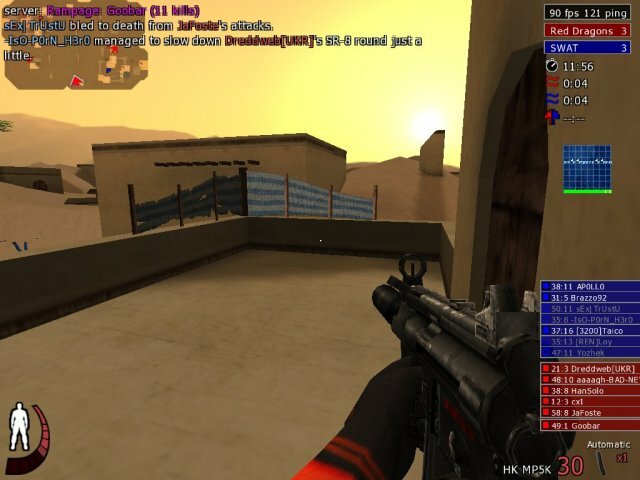 Just for comparison, the America's Army 2.6 version, which I last played in 2006 on the very same computer, yielded an average 45-50 FPS on most maps. I could keep going, but I guess I'll end here. Urban Terror is a superb product. It is, above all, a unique game with features unseen in other games. Furthermore, it is so well made you'll never suspect it's free. It has the whole look of an expensive, commercial game, only proving that free and open-source can go a long way when people put their hearts and talents to it. It is genuinely a great game. You must try it. Comparing these two games would be unfair - and quite unrealistic. They serve a different purpose and need to be treated that way. AssaultCube is an ultra-lightweight fun-bringer for people with weak machines or bad connection, who nevertheless yearn for some shooting fun. Small footprint, spartan demands and the ability to play (well) on dial-up definitely sound interesting. 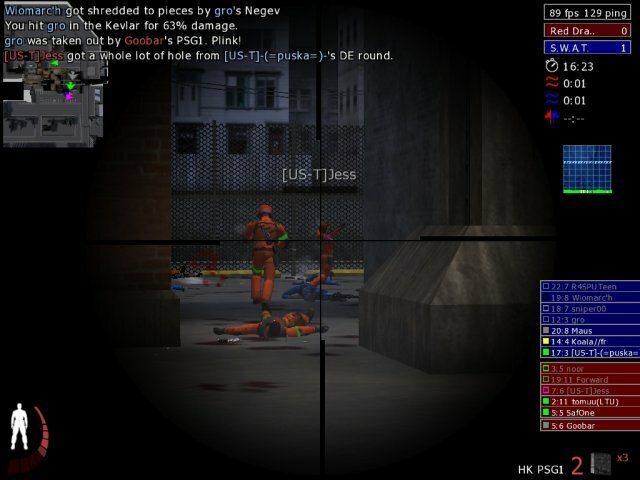 On the other hand, Urban Terror is a "heavy" game, catering to the classic FPS crowd. It's big and mean - and rewarding. The combination of maps, weapons, the gameplay physics, and the fast pace is phenomenal - and will keep you pasted to the chair for many a long hour. Here's a table summarizing the merits of each. Please note that the grades are based on MY experience. Well, I guess the review talks for itself. No need for grand closures. Just a heads-up, expect more game reviews in the future. I'll be reviewing non-FPS games, too, so stay tuned. Meanwhile, enjoy! P.S. I would like to thank good chaps at Ubuntu forums for exposing me to Urban Terror. Once again, the Community proves its merit.